Readers will find science-based ideas about how our early relationships shape the way the mind and brain develop from our young years into our adult lives. Our connections with caregivers induce neural circuit firings that persist throughout our lives, shaping how we think, feel, remember, and behave. When we are lucky enough to have secure attachment experiences in which we feel seen, safe, soothed, and secure—the “four S’s of attachment” that serve as the foundation for a healthy mind—these relational experiences stimulate the neuronal activation and growth of the integrative fibers of the brain. EMDR is a powerful tool for catalyzing integration in an individual across several domains, including memory, narrative, state, and vertical and bilateral integration. In Laurel Parnell’s attachment-based modifications of the EMDR approach, the structural foundations of this integrative framework are adapted to further catalyze integration for individuals who have experienced non-secure attachment and developmental trauma. The book is divided into four parts. Part I lays the groundwork and outlines the five basic principles that guide and define the work. Part II provides information about attachment-repair resources available to clinicians. 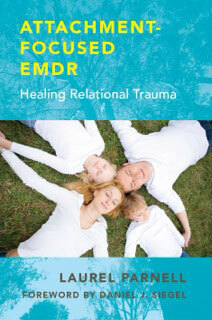 This section can be used by therapists who are not trained in EMDR. Part III teaches therapists how to use EMDR specifically with an attachment-repair orientation, including client preparation, target development, modifications of the standard EMDR protocol, desensitization, and using interweaves. Case material is used throughout. Part IV includes the presentation of three cases from different EMDR therapists who used attachment-focused EMDR with their clients. These cases illustrate what was discussed in the previous chapters and allow the reader to observe the theoretical concepts put into clinical practice—giving the history and background of the clients, actual EMDR sessions, attachment-repair interventions within these sessions and the rationale for them, and information about the effects of the interventions and the course of treatment.